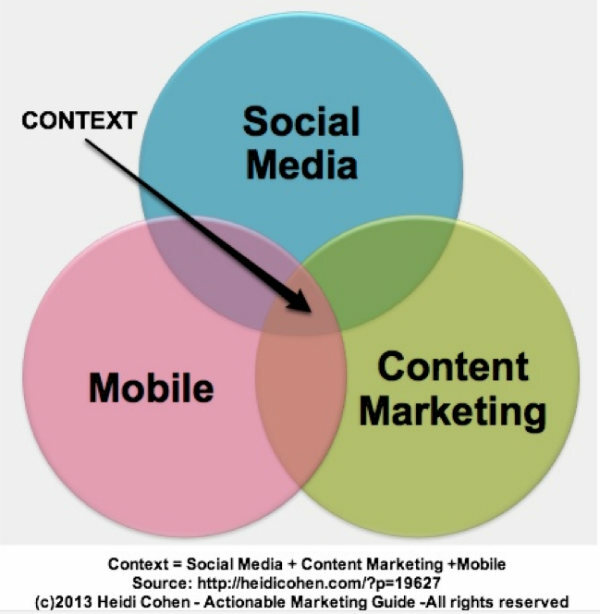 2014 is the year of content marketing! 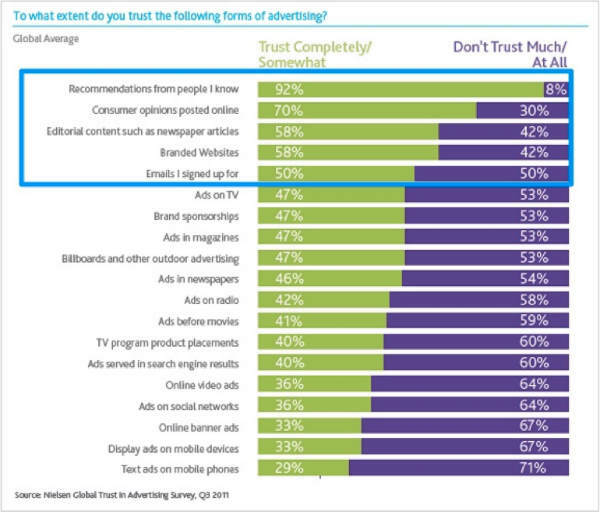 This isn’t a surprising new revelation, since consumer trust in advertising and push marketing has eroded over time. In fact, the sources customers trust most are other customers and content marketing (according to a 2011 study by Nielsen). In response, marketers realized they need a cost-effective way to reach out and connect with their target audience. Given this, it’s no surprise that a 2013 Content Marketing Institute and MarketingProfs study found that more than 90 percent of B2B marketers use one or more forms of content marketing to reach and engage their prospects and customers. Additionally in today’s connected world, everyone is a content creator — not just marketers and professional media entities. Social media, smartphones, and other connected devices enable and empower anyone to create content — even 13-year-olds! This content adds to the ever-growing amount of information. 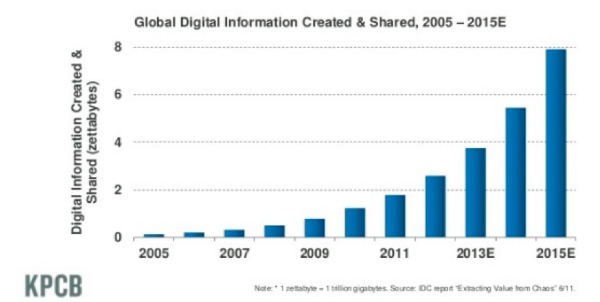 KPCB’s Mary Meeker reported that content is growing at an exponential rate — expected to reach 8 zettabytes by 2015. That’s a lot of content! While content production that exceeds our audience’s ability to consume it isn’t new, it does present a growing challenge for content marketers to use their resources wisely when creating content and helping it to stand out. Content effectiveness: There’s a flood of information that’s not reader friendly. Look to avoid content filled with corporate-speak and empty, “me-too” content that fills many media sites and blogs. Content packaging: To succeed, content marketing needs more than just useful information. The information must also be packaged to naturally appeal to your key audience. I call this “dressing your content for success,” and recommend using an effective title, attractive image, and easy-to-scan text to outfit content for optimal attention. Content context: Information must be relevant to the times, places, and ways it is intended to be accessed. This translates to the ability to deliver the appropriate content to the right delivery channel at the right time. If your information isn’t present when the consumer needs it — no matter what device they are using to look for it — someone else’s will be found and consumed instead. You can argue with your management team over the amount of additional budget you need to create more content that can compete for limited consumer attention. But chances are, if you’re like most marketers, you’re not going to get any incremental budget this year. Therefore to make your business stand out and engage prospects, customers and fans with great content, you need to think beyond your marketing. You need to think holistically about all of the content created across your organization. The good news: This doesn’t require incremental budget. So how do you take advantage of these resources and leverage them to create epic content? Here are the three key strategies to stretch your content marketing budget. Rethink your content across your organization: Every company creates lots of information. Take the time to track this content and determine where you can re-envision ways to create useful content people want to consume. This means all of the information produced in your firm — including sales pieces, product information, instructions, customer service, your website, legal documentation, human resources, and investor relations. When repurposing content for marketing purposes, make sure you skip the anonymous boring corporate-speak — write for humans, using language your target user can understand. In the process, assess where you can eliminate redundant content creation efforts so that you can spend more on content quality. 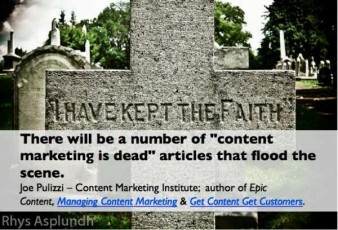 This is why not all content marketing is incremental. Create a few pieces of really “breakthrough” content: By examining your content creation across your organization, you can determine where you can create major pieces that attract attention in ways that you can build on throughout your content and marketing efforts. Even better: Make sure you plan to share these pieces on your social media platforms. Distribute your existing content more effectively: You don’t necessarily need to continually create more and more content. Instead, take some time to plan how you will promote your content, to get the most benefit out of each piece you create. At a minimum, try to utilize each piece of content across all of your owned and social media channels. Then, look into how you can incorporate often overlooked ways to extend your content reach, such as linking your content to appropriate product pages on your website or including a link to your content or blog in everyone’s outgoing emails. Leverage the power of your organization’s content marketing to ensure that your business maximizes its earning potential in 2014. Expand quality content creation beyond your marketing department. How do you plan to fund your content marketing plans? Read CMI’s how-to guide on Process, for more ideas on how to get the most value form your existing content marketing team, tools, and resources.